The body of a female American tourist, bound and with multiple stab wounds, was found Sunday near a road outside Jerusalem, police said. Her friend, a naturalized Israeli originally from the U.K., had reported her missing a day earlier after she was found nearby, also with knife wounds and her hands tied, police said. The two had been hiking in a nearby forest when they were assaulted by two Arab men and her friend was dragged away, she told police on Saturday. 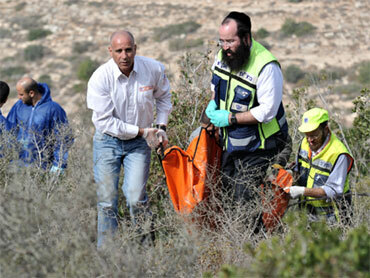 The woman's disappearance set off a large-scale hunt by police and military in the wooded hills outside Jerusalem. Before the body was found, police had been investigating other scenarios for how the crime might have unfolded. The discovery of the stabbed and bound body, however, reinforced the possibility that militants may have been involved, police said. Police spokesman Micky Rosenfeld said the dead woman was an American but had no further details. The Israeli press identified the dead woman as Christine Logan. Her hometown was not immediately available. Her friend, according to the press, is Kaye Susan Wilson. Police said there were no signs she had been sexually assaulted or robbed. As of late morning, no suspects were in custody. Dr. Yuval Weiss, director of Hadassah Hospital in Jerusalem, told Army Radio he expected Wilson would be released within several days. Police said Wilson told them she managed to escape her assailants by pretending she was dead. Afterward, she made it to a parking area where other people alerted authorities. This would not be the first time that hikers were attacked and killed. In 2007, two off-duty soldiers were shot and killed while hiking in the West Bank. In the 1990s, four Israeli hikers were killed in two separate attacks in the West Bank.